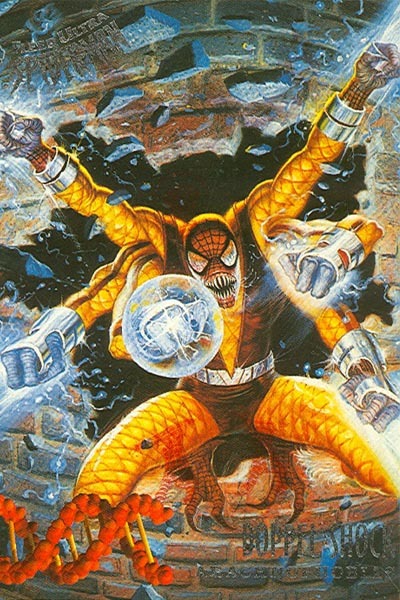 Powers/Abilities: Doppel Shock possesses the proportional strength, speed, and agility of a spider, and wears a vibro-shock unit on each of its six arms. History: (Fleer-Ultra Spider-Man, card#146) - Created from the spliced DNA of Spider-Man's Infinity War Doppelganger and the Shocker by the Jackal, Doppel Shock is a deadly threat to Spider-Man. Comments: Created by Jean-Pierre Targete. To the best of my knowledge, these guys never appeared anywhere else, and were created solely for the 1995 Fleer Ultra Spider-Man trading cards. However, given that the Jackal surely had all sorts of crazy schemes on the go, there's nothing to say these guys can't exist on Earth-616. This subset of the card series was titled "Arachnophobias". Bizarrely, a couple years later, Toy Biz released a line of hybrid Spider-villain action figures under the name "Arachniphobia" [sic]. Freaky. There is nothing about this character that is not insane. I don't even know why you'd need the Shocker's DNA. Big thanks to Mark Pellegrini for bringing these to my attention and providing scans.